Having recently added several new EasyBraid Soldering Stations to QSource.com, we're happy to tell you about EasyBraid's exciting promo: Buy 4 EB9000S Soldering Stations and get 1 FREE. 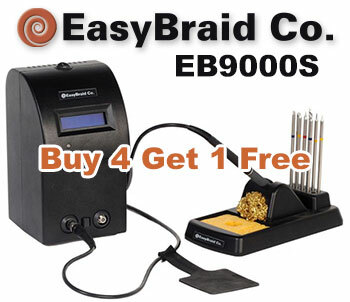 To take advantage of this excellent offer, customers need to purchase four EB9000S Stations from QSource.com, download and complete the redemption form from our site, and email or fax the form and a copy of their invoice (dated between January 1 - March 31, 2015) to EasyBraid to get a FREE 5th station. A UPS or FedEx account number must be provided as customers are responsible for shipping charges of the FREE station. EasyBraid's offer runs until March 31, 2015. To purchase your EasyBraid EB9000S Soldering Stations and download the redemption form to receive a 5th one FREE, please visit QSource.com. For further information, you may also contact Q Source by phone (800-966-6020), email, or via our Web site. QSource.com also offers an entire line of EasyBraid products and accessories. Please note: Redemptions must be postmarked within 30 days of the distributor invoice date.